Once the flower is ripened and pollinated, it will produce a bulbous seed pod at the base of the flower. When the green seed pod matures and turns tan or brown, clip it off the stem. Bring it indoors and place in a paper bag to dry for a few days. Once dry, the pod will split. Shake the seeds from the pods. Each pod should have several seeds it it. The seeds will be viable for 9-10 months when stored at room temperature. For longer storage keep in them in an air tight container in the freezer. Sow the seeds fresh (right away) or store them in a paper bag at 41F and sow next spring but germination will be reduced. Growing lilies from seed is a long process and requires some patience. 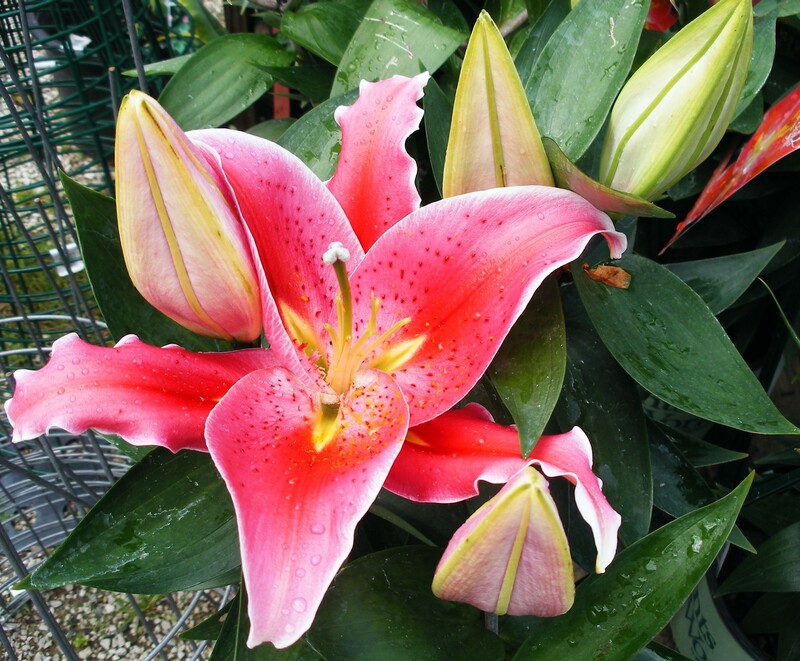 Oriental lily (Stargazer) seeds are delayed hypogeal that germinate slowly in two stages. Warm period: place the seeds in a clear plastic bag with spaghnum moss, peat moss , vermiculite or coarse potting soil mixed w/ granite grit or place seeds on a dampened paper towl and place it in a plastic bag. Seal, label and store in a warm spot (60-70F) for 3-4 months at which time seeds will form small bulblets with delicate roots. Germination can take up to 3-4 months depending on the type of lily. Cool period: Take the bag with the swollen bulblets and place it in the refrigerator (34-40F) for 10-12 weeks. Keep away from fruits and vegetables. Another option is to plant the bulblets in small containers and keep in a cool place (above 32 F to below 50F) for 3 months. After cooling period, plant tiny bulblets in loose potting soil mix 1/4 inch deep. Place under lights or window or if weather permits (frost free) outdoors in a protected area. The true leaves should show in 1-2 wks.. Water, feed with diluted fertilizer every two weeks. You should get 3-5 leaves the 1st growing season. Keep seedling potted the first season or transplant in the spring toÂ a protected area in the garden. You should have blooms in the 3rd season. Seeds from a hybrid cross lily will not produce true clones of the parent plant but you can get some interesting new possibilities. Can anyone teach me how to plant stargazers using its seeds? The above article has all the information you need to start stargazer lilies from seed. in a clear bag and go through the 2 steps you explain? You can plant the seeds directly into the ground. By planting the other method you have more control of their growth and better a germination rate(more plants). Once germinated, the seedlings are delicate and need extra care, so they don’t dry out etc. If you have a good soil bed to start them in, then they should be just fine sown directly in the soil.